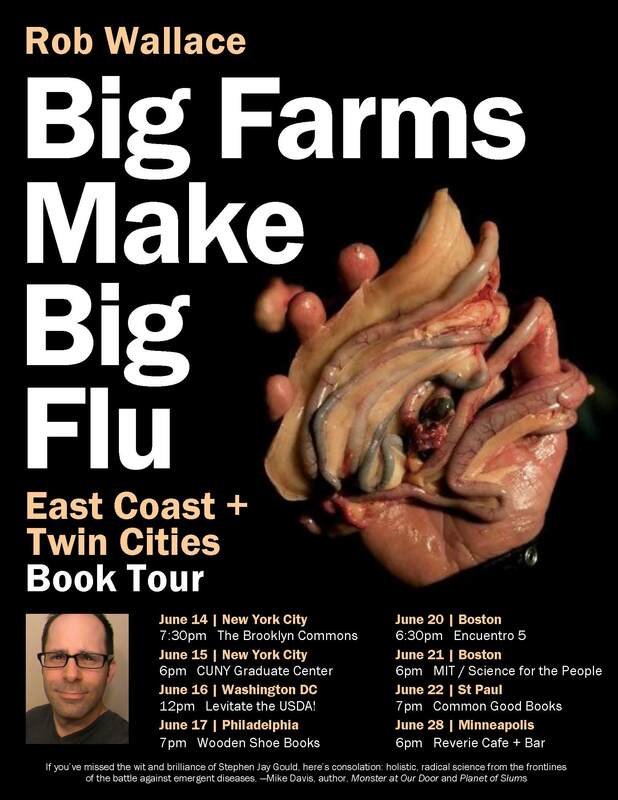 The East Coast/Twin Cities tour for my new book, Big Farms Make Big Flu, has now been finalized! A day after the book launch with the Marxist Education Project at Brooklyn Commons, I’ll be talking capitalism and the production (and destruction) of animals with Ashley Dawson, author of Extinction: A Radical History, and food systems analyst Siena Chrisman at the CUNY Grad Center. We’ll be Levitating the USDA in Washington DC! With 25% book discounts for USDA employees. And we’ve added an appearance at MIT with Science for the People. Facebook pages for all events are listed here. All are welcome! Feel free to share the tour poster! Apparently there’s a liberal equivalent to Donald Trump’s Sinophobic expediency. In a New York Times op-ed yesterday, Sonia Shah, the author of a forthcoming book on pandemics, presents a nationalistic disease ecology, characterizing avian influenza as the dirty Chinese’s fault. As if the industrial model of production didn’t originate in the States. 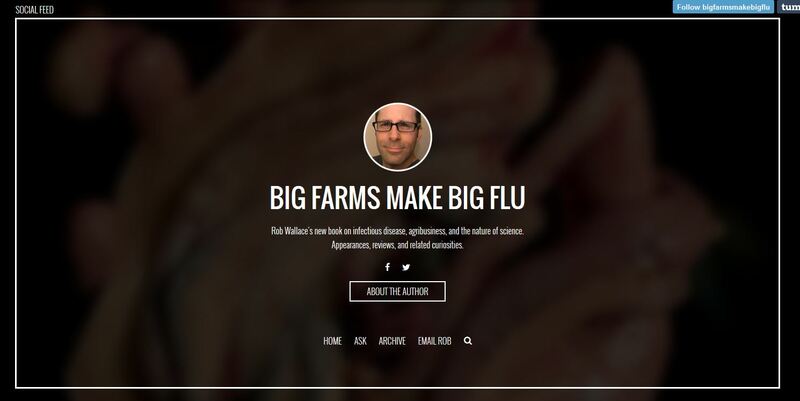 Here’s the Tumblr page for my new book, Big Farms Make Big Flu. It’ll include author appearances, reviews, events around the book, vids and articles, and related curiosities. The book–essays on infectious disease, agribusiness, and the nature of science–is available for pre-order here. I’m proud to announce Monthly Review Press is publishing my new book on infectious diseases, agribusiness, and the nature of science. The book collects (and revises) many of the pieces I’ve posted here at Farming Pathogens, but in addition a number of my peer-reviewed publications and five additional essays never before published anywhere. The book is slated for release this May and can be pre-ordered at the Monthly Review Press site. The Union of Concerned Scientists is calling upon agriculture and health scientists to sign on to a statement demanding increased public investment in agroecological research. Former U.N. Special Rapporteur on the Right to Food Olivier de Schutter describes the need for such research in the video above. While other approaches may also yield promising solutions, they are more likely to already benefit from private sector support. Agroecology is less likely to be supported by the private sector since these farming methods often reduce requirements for purchased inputs. This leaves to the public sector the responsibility to fund agroecological research that serves the interests of farmers and society. 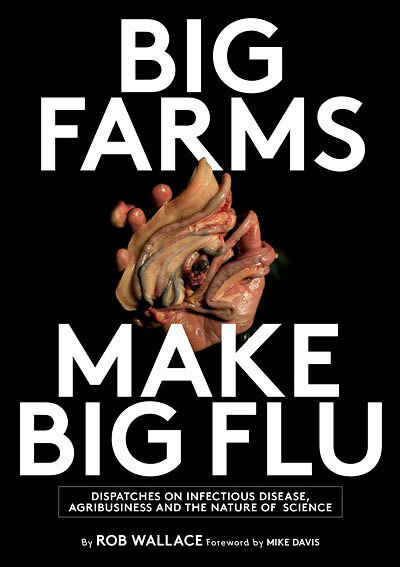 ‘Farming Pathogens’ will be taking a break while we finish up a book on many of the topics discussed here, including influenza and agribusiness. Thank you for your support and feedback. 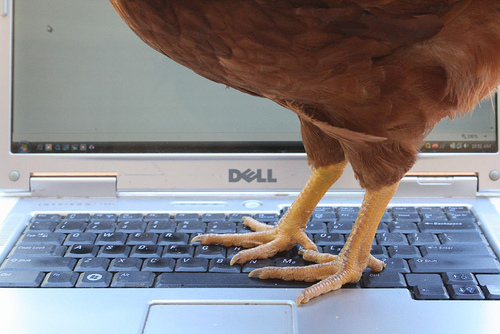 We’ll be back soon, promise, and in all likelihood will drop a post now and again. Agriculture, disease and evolution are unlikely to enter any hibernation while we step out for a bite. Dallas: [looks at a pen being dissolved by alien’s body fluid] I haven’t seen anything like that except, uh, molecular acid. Brett: It must be using it for blood. 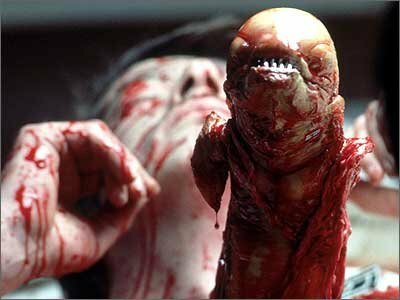 Parker: It’s got a wonderful defense mechanism. You don’t dare kill it. NASA announced earlier this month one of its research teams discovered an ‘alien’ bacterium at the bottom of California’s Mono Lake. Call off the men in black, it’s strictly still a matter for the nerds in white. The bacterium isn’t really from another planet, even as we all are a kind of astronaut wherever and whenever we find ourselves spinning through space and time. Rather, this earthly bug showed under the kinds of stringent conditions found on other planets it could assimilate arsenic into its very cellular fabric in place of what was until now thought mission-critical phosphorous.